Scientists at the University of Warwick have discovered the first white dwarf pulsar we’ve ever seen. The super-dense body is housed in an exotic binary star system 380 light-years away from Earth. Image credits Mark Garlick / University of Warwick. Professors Tom Marsh and Boris Gänsicke of the University’s Astrophysics Group together with Dr David Buckley from the South African Astronomical Observatory, have made astronomical history — they have identified the first white dwarf pulsar humanity has ever seen, in the neighboring system of AR Scorpii (AR Sco). Astronomers have been on the lookout for this class of pulsar for over half a century now. AR Sco is only 380 light-years away from Earth, in the Scorpius constellation. 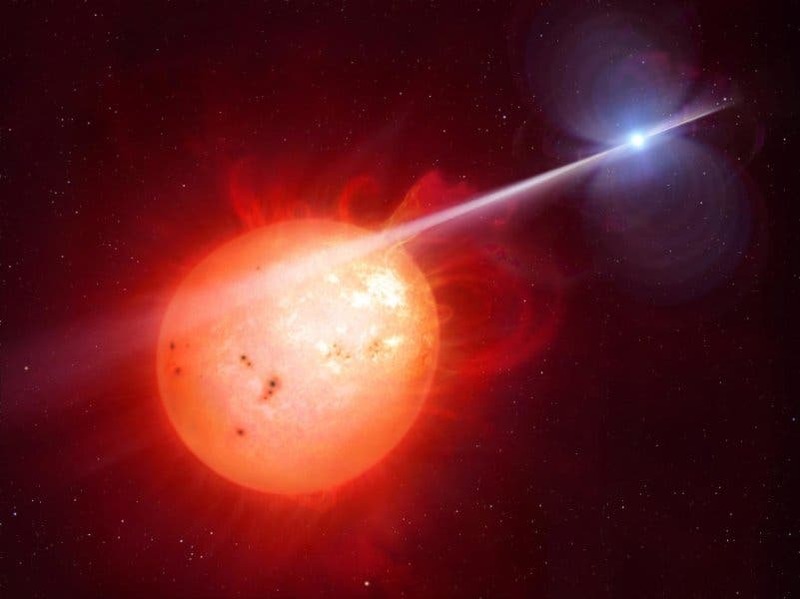 It has two stars — a very rapidly spinning former star known as a white dwarf pulsar, and an actual star known as a red dwarf — locked together in a 3.6-hour orbit. The red dwarf isn’t very noticeable in and of itself. It weighs one-third of a Solar mass (the biggest ones reach one-half of a solar mass). It ‘burns’ hydrogen just like our Sun but at a much slower rate. So it’s not particularly hot or very bright at all. Standard red dwarf across the board. However, its choice of companions creates some spectacular interaction which brought the scientists’ attention to the system in the first place. Its neighboring pulsar isn’t much bigger than Earth, but it’s an estimated 200,000 times denser. Like other pulsars, it’s a very lively celestial body. What sets it apart is the way it formed. Neutron stars/pulsars are the naked cores of huge stars squashed by supernovae into pure matter — they’re one huge atomic nuclei, without any empty space for electron orbits or personal space or whatnot. It’s the closest a star can get to a black hole without turning to the dark side. The white dwarf pulsar is smaller, less dense, and formed after the outer layers of a Sun-like star breezed away into a planetary nebula. “White dwarfs and pulsars represent distinct classes of compact objects that are born in the wake of stellar death,” NASA explains. A white dwarf pulsar, like AR Sco, doesn’t cool off into a black dwarf but retains enough energy to accelerate subatomic particles as a pulsar. “Similar to neutron-star pulsars, the pulsed luminosity of AR Sco is powered by the spin-down of the rapidly rotating white dwarf that is highly magnetized,” the paper reads. It has an electromagnetic field 100 million times more powerful than our planet’s and makes a full rotation in just under two minutes. Because of this gargantuan magnetic field, AR Sco acts kind of like a natural particle accelerator. We’re talking about monumental levels of energy here. Matter inside it is squashed down to extreme conditions and emits huge levels of radiation and charged particles as focused ‘beams’. These occasionally whip at its neighbor, causing the entire system to spectacularly brighten and fade every two minutes. “The new data show that AR Sco’s light is highly polarised, showing that the magnetic field controls the emission of the entire system, and a dead ringer for similar behaviour seen from the more traditional neutron star pulsars,” Prof Marsh says. The beams radiate outwards from the pulsar’s magnetic poles. Think of it like a huge lighthouse in space spinning really fast. Each time the beam hits the atmosphere of the red dwarf, it speeds up electrons there to almost the speed of light. This interaction is what causes the red dwarf’s brightness to flicker. It suggests that the star’s inner workings are dominated by its neighbor’s kinetic energy — an effect which has never been observed before, not even in similar types of binary stars. Graphical simulation of a pulsar. Credit: Giphy. “AR Sco is like a gigantic dynamo: a magnet, size of the Earth, with a field that is ~10.000 stronger than any field we can produce in a laboratory, and it is rotating every two minutes. This generates an enormous electric current in the companion star, which then produces the variations in the light we detect,” Professor Boris Gänsicke added. The distance between the two stars is around 1.4 million kilometers — which is three times the distance between the Moon and the Earth. The full paper ‘Polarimetric evidence of a white dwarf pulsar in the binary system AR Scorpii’, has been published in the journal Nature Astronomy.